I want to see Gary Johnson, of the Libertarian Party, as our next President. Quixotic dreamer that I am, I think he actually could become the occupant of The Oval Office if things fall right. He's polling in the low double-digits at present. If he can crack 15% in select national polls, he will be given a place on the stage during the presidential debates this fall. If that happens, anything can happen. And I'm fairly militant about my candidate, too. Ask me my opinion and I'll give it to you straight. I think Trump and Clinton are BOTH unfit for the office. Whichever one of them wins - if, indeed, one of them does win - I'll be a combination of sad, angry and disillusioned that I have never been before. Having said that, though, I am trying desperately to not alienate the people who really matter to me. I am trying to hold my most strident political opinions in check when I am in the company of those folks I love but who may have a differing opinion. I'm trying, but I'm failing - sometimes. And that's what my column in today's Boston Herald is about. A tactful way to approach people, if you want: "Yes, being angry enough about the whole situation not to vote at all is one valid way to approach this. It seems to me, though, that this approach doesn't do anyone any good. Perhaps voting for a third party candidate, such as Gary Johnson, would be a more productive way. If he gets enough votes, it might keep either of the other two from getting a clear majority, and even if that doesn't happen, a solid showing for him would send a message to Washington that there are a lot of people who are tired of the game." What disturbs me most is the media ignoring third party candidates, except as anomalies. No longer are they kooks, crackpots, or dingbats. It is a sad state when the masses are convinced the only choices they have are from the two major parties. 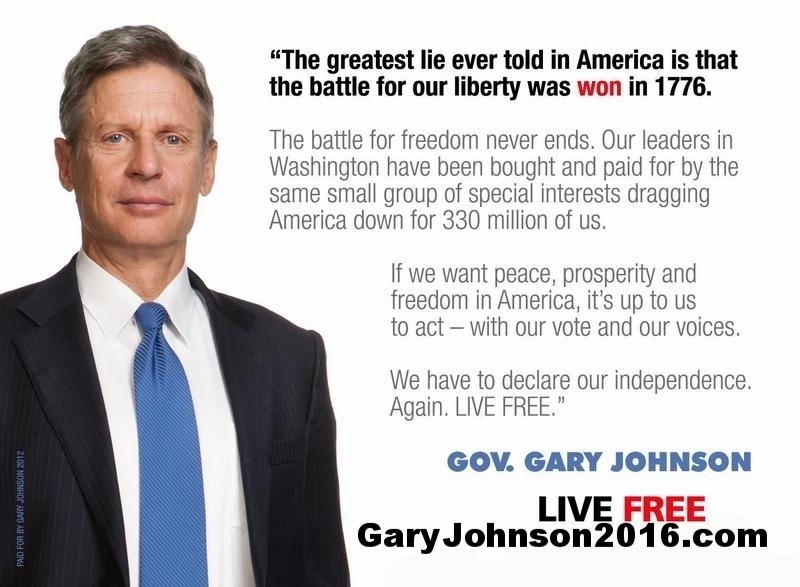 VOTE FOR GARY JOHNSON! Sorry, didn't mean to "yell". He had been our governor, and I enjoyed his policies. As far as choices go, sure beats Clinton and Trump. Well, the 800 pound gorilla in the room that's being ignored is Ralph Nader, right? Remember George, he's got Ralph to thank for his election, along with a bit of malfeasance in the good state of Florida. If you see no difference between Clinton and Trump, I have nothing for you. I guess it boils down to do you want the country to be run by a politician who has wavered and bend where the wind blows, or do you want a demagogue, who hasn't the vaguest idea how to be the ceo of a country. If Trump is your guy back there on the east coast,m probably has nothing to do with the fact that over 95% of his supporters are white males, eh? Nah, couldn't have anything to do with it. If he wins, do enjoy. boy, won't things be fun then....gettin' all those muslims out of boston, hell, maybe you can clear out southie from all those 'undesirables', eh? I am voting for Johnson. I am not voting for Trump. I am not voting for Clinton. My vote for Johnson is not a vote for (or against) anyone else. As for your claim that Nader elected Bush, you are dead wrong. You conveniently forget that Pat Buchanan was also a candidate in that race. His vote total in four states, if added to Bush's, would have put Bush over the top in those four states - New Mexico, Oregon, Iowa and one other that escapes me at the moment. Anyway, this is America. I am not obligated to vote for one of two candidates. Furthermore, I do not wish to drive Muslims out of Southie or anywhere else. I have no idea where you get that. You are a font of misinformation and I have no respect for your opinion at all. Craig - I guarantee they'll be on the ballot in all 50. That aside, though, vote your conscience. That's all I ask of anyone. So long as you aren't voting for the lesser of two evils - which, as you know, gets you evil - I'm satisfied. Daryl - And I, you. I, too, am voting for the Libatarians. I watched on CNN the other evening. They made so much sense. a comment. I've bookmarked your site and shared this on Twitter.